At the Brockton Animal Hospital it is our goal to be responsive to our clients’ and patients’ needs, and compassionate in providing quality veterinary care. Our practice specializes in care for pet companions providing for their needs from birth through the geriatric years. Brockton Animal Hospital, a member of the community for over 50 years, operates independently of large corporate ownership. We provide care in a personal and professional setting. Welcome to The Brockton Animal Hospital! 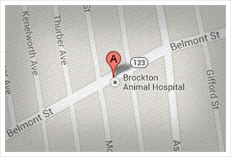 Brockton Animal Hospital has been a privately owned business since its founding in 1957. As an established veterinary practice in operation for more than 60 years, Brockton Animal Hospital is not content to rest on our reputation. Instead, we choose to constantly reinvent ourselves, by innovating and providing our clients with the most advanced veterinary care available. We enjoy a clientele of long-standing friends and patients, and welcome new clients and patients every day. Along with dogs and cats, Brockton Animal Hospital enjoys all species of pets and treats all animal companions. The best way to keep your pet happy and healthy is to receive regular and attentive veterinary care. Our highly-trained staff is always ready to assist. We encourage and welcome any questions you may have. This level of client service demonstrates the degree to which we personally care.